Though All Saints Day was yesterday, I want to highlight two more lesser-known saints today and tomorrow. 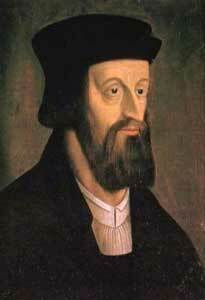 John Huss is nowhere near the household name (well… Christian household name) that Martin Luther or John Calvin is. But he tilled the ground for these and others. Huss taught and pastored in Prague. Like the better-known reformers that would follow him, Huss criticized the established church of his day. He held that the Bible should be in the hands of the masses. In his view, the only proper “head” of the Church was not any humanly established church government, but Jesus Christ. He advanced the Reformation idea of “Sola scriptura”—that the Bible alone should be the authority in issues pertaining to life and doctrine. In November 1414, the Council of Constance assembled, and Huss was urged by Holy Roman Emperor Sigismund to come and give an account of his doctrine. Because he was promised safe conduct, and because of the importance of the council (which promised significant church reforms), Huss went. When he arrived, however, he was immediately arrested, and he remained imprisoned for months. Instead of a hearing, Huss was eventually hauled before authorities in chains and asked merely to recant his views. When he saw he wasn’t to be given a forum for explaining his ideas, let alone a fair hearing, he finally said, “I appeal to Jesus Christ, the only judge who is almighty and completely just. In his hands I plead my cause, not on the basis of false witnesses and erring councils, but on truth and justice.” He was taken to his cell, where many pleaded with him to recant. On July 6, 1415, he was taken to the cathedral, dressed in his priestly garments, then stripped of them one by one. He refused one last chance to recant at the stake, where he prayed, “Lord Jesus, it is for thee that I patiently endure this cruel death. I pray thee to have mercy on my enemies.” He was heard reciting the Psalms as the flames engulfed him.